is located in the hamlet bearing the same name, within the area of San Casciano Val di Pesa district, in the provice of Florence. 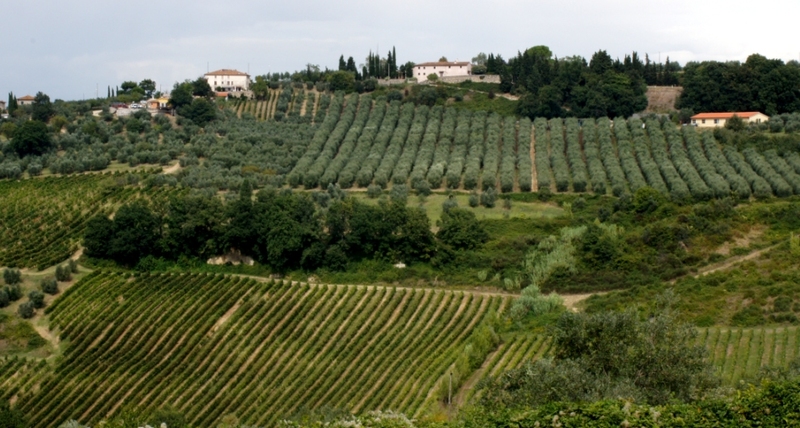 It covers an area of 27 hectares: 6 are Chianti Classico dedicated vineyards and 17 are Chianti Classico dedicated olive groves with about 5000 plants of Chianti Classico olive trees. In addiction, the estate owns 170 hectars of rented areas nearly with about 90 hectares of dedicated olive groves with 21000 olive trees and 50 hectares of Chianti Classico dedicated vineyards and Chianti vineyards. The estate produces plain extra-virgin olive oil and extra-virgin Chianti Classico Olive oil as well as extra virgin IGP olive oil (IGP= geographical protected indication) made through olives coming from its own olive groves with typically tuscan plants such Frantoio, Leccino, Moraiolo and Pendolino that grow according to the so called “vaso cespugliato” process. Every olive grove is located up on the hills. Olives are picked by hand by mid-October when they are not fully mature yet. they are taken to the Talente Estate oil-mill where they are pressed within 24 hours time in the estate’s own olive-mill. Here old tradition meets modern technology thanks to the Alfa Laval continued cycle with a production capacity of 12000 kilos of olives / hour. and a brilliant green coulour that may assume gilder shades after some time. Our love for this area and its produce has given us the inspiration to create a genuine product that can preserve its vitamin-enriched contents to be employed in our daily cuisine. The magazine “Spirito Divino” has written about our product following a selection performed by scientists at the university in Bologna; moreover the Estate has also been on show at the Uffizi Academy of Florence for a tasting selection and eventually for another tasting selection of olive-oils within the Province of Florence. This latter event gave us the chance to participate in various shows on a national and international scale. Our olive-oil mill has been working since 2000. it operates through a so-called HACCP self-control system. The oil is produced, bottled and sold in our own mill at Talente throughout the harvest. Bottles may have different sizes: 0,250/0,500/0,750/1 liter bottles are available and they all come under the estate’s registered mark “Cassiano”. As for the pressing of olives, a bunch of different estates come and have their olives pressed at our Estate. This is mainly because we take a particular care of the different pressing stages as to obtain a superlative and long-lasting product. Within this domain we have been able to build up a very solid relationship with this segment of clients based on mutual respect and satisfaction.